The time has come for thousands of like-minded motorcycle enthusiasts to join together and celebrate all things motorcycles. 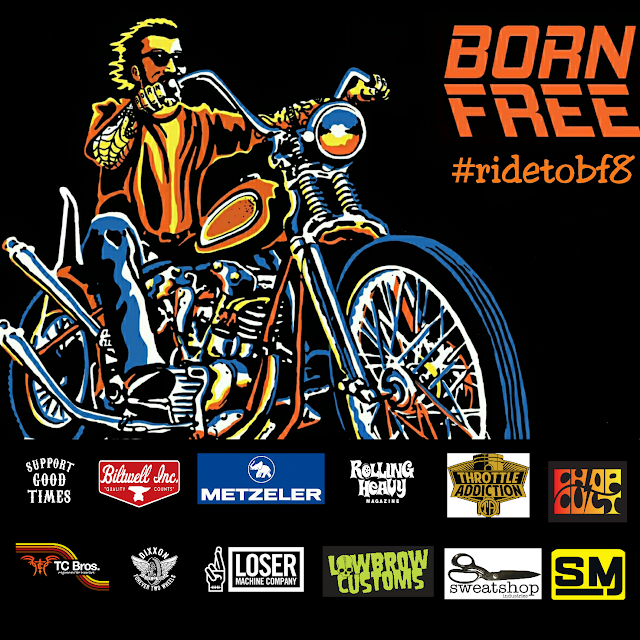 Over the past eight years, the Born-Free Motorcycle Show has grown into the premier motorcycle show on the west coast and we're honored to have been included every year. Each year, Mike Davis and Grant Peterson have hand picked certain individuals to showcase their building aesthetics. Kindly take a moment to meet some of the Born-Free 8 Invited Builders and give them a follow. Follow Jim Harper, Arie Vanschyndel, Tom Fugle, Uwe Ehinger, Max Schaff, Matt Olsen, Kiyo Mitsuhiro, Jason Sheets, Andy Carter, Caleb Owens, Dalton Walker, and Matt Machine on Instagram to see what they built. The last Invited Builder will be announced during Show Class Magazine's People's Champ party at Cook's Corner. Swing by Motornation.tv to subscribe for a plethora of movies to tickle your fancy. Kindly give them a follow on Facebook and Instagram. 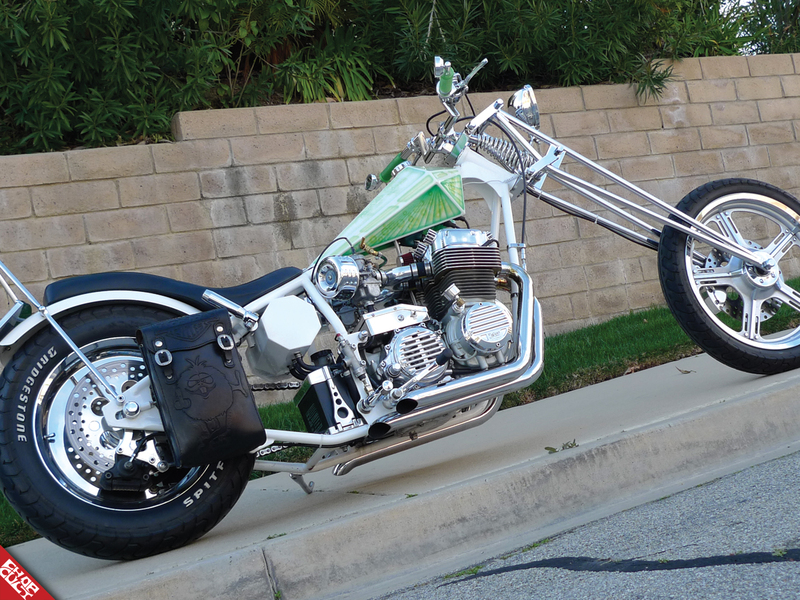 Sponsored by ChopCult and Painthuffer Metal Flake. Be sure to come check out the Art & Fuel Exhibit showing at Born-Free this weekend. 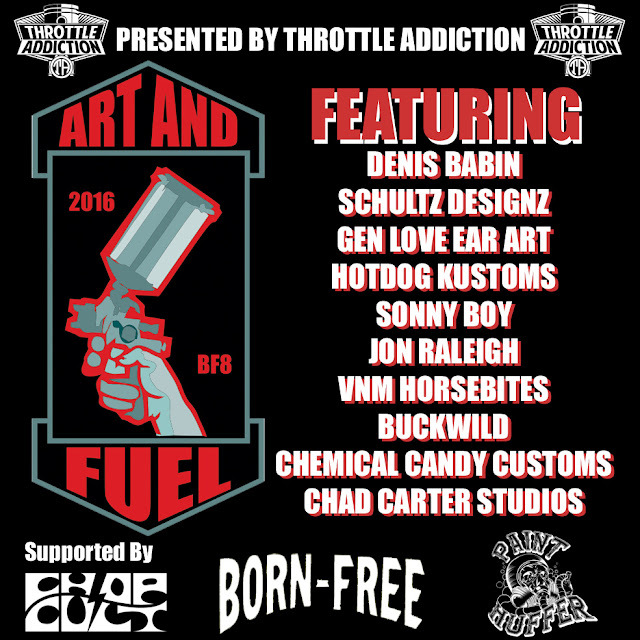 10 Extremely talented artists have painted Throttle Addiction tanks to be shown exclusively at this event. Be sure to come find it and check out their hard work. The exhibit will be located at the far opposite end from the public entrance, near the smaller Dice stage. If you can't make it, check out Throttle Addiction's Instagram feed for photos of their beautiful work. Duane and I will be manning the ChopCult / DB Custom Leather booth, so swing by if you have a chance. We'll be located in Loser Machine's row, under the big tree. Just look for Funkenstein. Have a safe trip and be sure to enjoy the ride!